36. Sollas, William J. 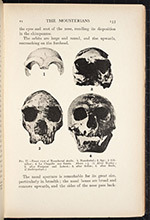 (1849-1936). Ancient Hunters and their Modern Representatives. London: Macmillan, 1911. 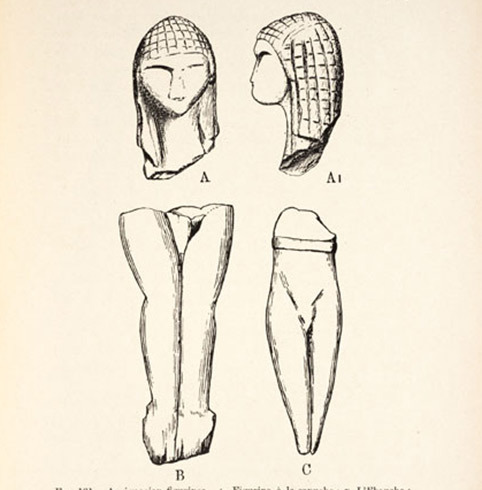 In 1864, the very first carved depiction of a female figure was discovered at the cave of Laugerie-Basse, in the Dordogne region of France. It was called by the discoverer, rather impishly, the “Venus impudique,” in contrast to the classical Greek statue of the female figure, the Venus pudica, or modest Venus. All later discoveries of carvings of the female form have consequently been called “Venus figurines.” The immodest Venus is shown at the right of the displayed plate, in two different views. 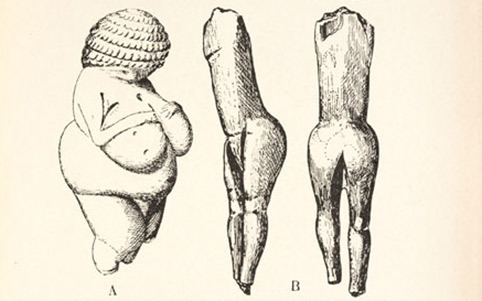 The figure on the left is the Venus of Willendorf, discovered in Austria in 1908, and still one of the most famous of all the Venus figurines. 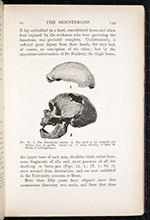 George Macurdy, who first brought news of the Venus of Brassempouy to the English-speaking world, happened to be in Vienna in 1908 when the Venus of Willendorf was brought in, so he conveyed its discovery as well to England and the United States.